The Cartography and Geographic Information Society (CAGIS) invited us to display art for the 28th International Cartographic Conference of the International Cartographic Association, supporting two exhibitions in Washington, DC. 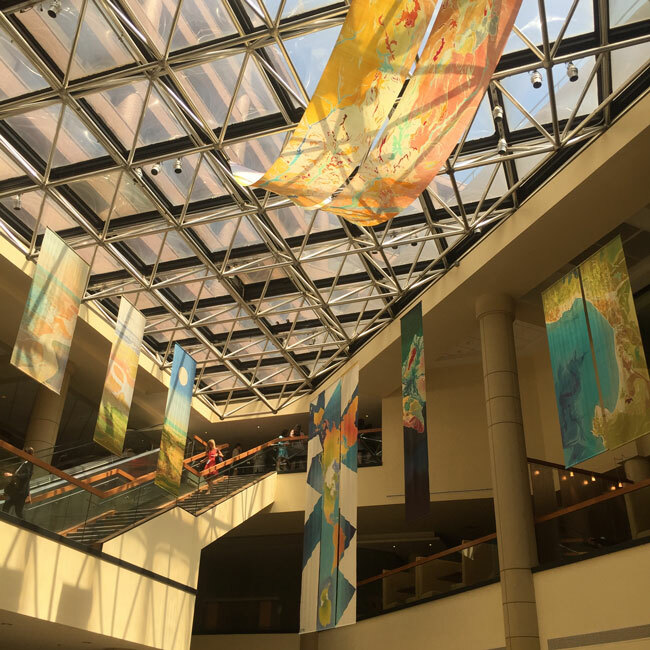 “cARTography” at Wardman Marriott (2660 Woodley Road NW) atrium installation is now open to the public, on display until July 6th at noon. Large-scale silks hang from the gridded ceiling. “Rising Tides” at the Joan Hisaoka Healing Arts Gallery (1632 U Street, NW) opens July 5th, with a public reception Friday, July 7th, 7-9pm, on display until August 26. Gallery hours are Wednesday-Friday 11am – 5pm and Saturday, 11am – 3pm. See a video shot during the load-in at the Healing Arts Gallery. We are honored to be working with director Spencer Dormitzer and wonderful staff at the Joan Hisaoka Healing Arts Gallery whose mission is to promote physical, emotional, and mental resources that lead to life-affirming changes for people affected by cancer. I have so many friends and colleagues in DC. Please try to catch me while I’m town!